DISTILLING VODKA click here Usually this will fit on a 50 gallon barrel to a 1000 gallon boiler. This four inch diameter Moonshine Still tower is ten feet tall. Made of copper and fully packed of copper wire mesh in the tower. This is included in price. Comes with all fittings, stainless steel clamps. All you need is a pot. Or ask us to provide you with one. We can fabricate any size. This still has a quadruple coil. This four inch tower will produce up to 95 % . For best results do a stripping run first, put the low in es back in to your boiler and run the still around about 3 gallons an hour. This will produce the 94’s plus. This four inch still is for the micro distillers who wish to produce a lot of product. 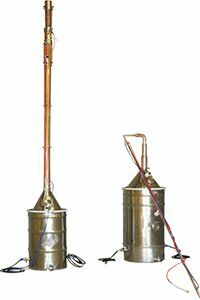 For these stills, such as 4- stills side by side- will produce around 12 gallons an hour. Rainier Distillers can always customize the still to fit your needs. Custom stills have been built, check our photos section.